Are you interested in reliving the days of when you were young? 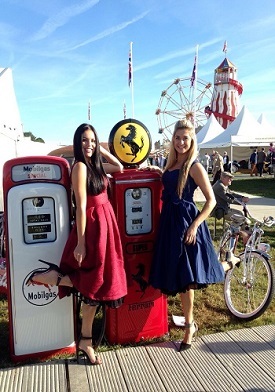 Well Goodwood revival is the best place to go. Goodwood revival is a motorsport event. It is where thousands of enthusiastic people come dressed up to recreate the circuits glory years between 1948 and 1966. It has its very own radio station, food stores and many shops designed to help you recreate those amazing days. The revival takes place at the motor circuit, which sits around the outside of a Second World War airfield. Also Goodwood holds an event next to the circuit which is home to a vintage fun fair, live music, a bar, catering and shops. When is the revival and how much are the tickets? The revival is on the 8th-10th September 2017. The tickets vary depending on the days on which you decide to attend it. On Friday 8th the price starts at £53 for adults and for young adults (21-13) it costs £25.50. On Saturday 9th and Sunday 10th the prices start at 76 pounds for an adult and for young adults it costs £36.50. For children under the age of 13 year olds it is free but you have to bring proof that your child is under 13.
Who or what will I see? You will see some spitfires, hurricanes and North American mustangs as Goodwood Revival is one of the world’s greatest displays of vintage aircrafts. What else goes on at Goodwood? There are multiple things you can do at Goodwood circuit when the revival is not on. You can get a tour of the site in a plane! You can do different types of golf experiences prices starting at £99, you can even drive on the circuit also starting at £99. Finally, you can hire the grounds and have your wedding, birthday party or any celebration you want there. If you are promoting your business at Goodwood or simply need someone to look after your guests, we have hundreds of staff based local to Goodwood with varied skills. Get in touch to discuss your requirements or simply pop us an email to get a quote!